Is there a cooler racing livery than Gulf? Probably not, and thanks to the fact that LEGO’s colour palette is ever expanding (just like your Mom), it’s one that is now buildable from our favourite Danish bricks. Previous bloggee Greg998 has done just that, with this gorgeous 1970 Gulf-Racing Porsche 917K, resplendent in the oil company’s famous blue and orange livery (with a few custom decals too), under which is a wonderfully detailed flat-12 engine. See more of Greg’s brilliant Porsche 917K on Flickr via the link above. The year is 1970, and Porsche need to win some races. Their new 917 endurance racer proved hugely unstable in 1969, with downforce still a relatively new phenomenon harnessing it was still largely experimental. Cue chief engineer John Horsman, and an unlikely revelation caused by the splattering of bugs on the Porsche’s bodywork. John noticed that the 917’s tail was clean from insects, meaning that air wasn’t reaching it. A hasty modification with some aluminium sheets was made to the cars, and the 917 was transformed. The newly modified 917K won all but one race in the 1970 endurance championship, taking first and second at Le Mans and, along with the Porcshe 908, relegating Ferrari to fourth place. The 917 was run by serval works and part-works teams in the early 1970s, and it dominated sports car racing. The most famous of these are perhaps the Gulf Racing cars, thanks largely to Steve McQueen and his 1971 film ‘Le Mans’. It’s this car that Technic building legend Sariel has chosen to recreate in Lego form, and he’s done so brilliantly. Underneath the incredible bodywork (which includes wonderful period-correct decals) are no less than four LEGO RC Buggy Motors, with two third-party BuWizz 2.0 bricks controlling a pair each. This gives Sariel’s Porsche 917K both amazing speed and the ability to be controlled remotely via a bluetooth device. Sariel’s 917 also features fully-independent double-wishbone suspension both front and rear, dihedral opening doors, and remote control steering that turns the steering wheel in the authentically detailed cockpit too. It’s one of the finest Technic supercars of 2018 and one that is definitely worth a closer look. An extensive gallery of images is available to view at Sariel’s Porsche 917K Flickr album and you watch a video of the model in action and join the discussion courtesy of the Eurobricks forum. See more of Sariel’s astonishing Technic recreation of the greatest endurance racer of the 1970s via the links above, and you can watch the original trailer for the 1971 movie ‘Le Mans’ by clicking here. The All Japan Sports Prototype Championship (JSPC) was one of the world’s wilder race series. Running from the early ’80s to the early ’90s it pitched various classes of endurance racers against one another on Japan’s fastest circuits. Porsche dominated the series, winning seven of the eleven Championships, with Nissan, Toyota and BMW taking the remaining four. The Porsche 962 proved the car to beat, and yesterday’s Guest Blogger Prototyp has built three of the 962s that raced in the 1988 Fuji race. Each features the livery from a different team running the Porsche 962 in the late ’80s and there’s more to see of all three versions at Prototyp’s Porsche 962 Flickr album by clicking here. With nineteen overall wins (plus numerous class victories) Porsche have won the Le Mans 24 Hours more times than any other manufacturer. Over their 70 year history they’ve also raced in some wonderful liveries, advertising everything from fuel to cigarettes to alcohol – basically all the cool stuff. To mark their 70th year Porsche will be fielding three of their iconic past liveries in the GTE Pro class at this year’s Le Mans 24 Hours race. Flickr’s Lasse Deleuran has recreated each in Lego form, applying them to his previous Porsche 911 RSR design, and they look incredible! Head over to Lasse’s photostream via the link above and pick your winner! Six minutes and eleven seconds. The fastest ever lap of the fearsome Nurburgring Nordschleife, recorded not by a Formula 1 car or a Bugatti Veyron, but way back in 1982 by this; Porsche’s amazing Group C 956. Powered by a development of the successful 936’s turbocharged flat-6, the 956 took power to over 600bhp and used the world’s first double clutch gearbox to send it to the rear wheels. Jacky Ickx and Derek Bell debuted the car at the 6 Hours of Silverstone before taking pole, ahead of Porsche’s two other 956s in second and third, at the Le Mans 24 Hours. The race finished as it started, with Porsche taking a 1-2-3 and with Ickx and Bell claiming their third win together for the Porsche team. This superb recreation of Porsche’s dominant early ’80s Group C Champion comes from Flickr’s Manuel Cara, which despite its small size is wonderfully accurate, made more so by the authentic-looking period Canon decals. There’s more to see of Manuel’s 956 at his photostream by clicking here, and if you’d like to see the real car in action, take a look here! This is the McLaren M23, a car that raced in Formula 1, Formula 5000, and the Indy 500 over five seasons between 1973 and 1978. Powered by the ubiquitous Cosworth DFV engine and with relatively unremarkable bodywork the M23 was not the most innovative car of the time. However McLaren’s continual development of the M23 kept it amongst the front-runners of Formula 1 right up until the arrival of the M26 mid way through the 1977 season, earning two Driver’s and a Constructor’s World Championships, sixteen Formula 1 race wins, and multiple podiums. It was towards the end of the M23’s career that it won probably the most famous Formula 1 Championship of all time, when James Hunt emerged victorious from a season-long battle with Ferrari’s Nikki Lauda at a rain-soaked Fuji Speedway. The 1976 season has been immortalised in the 2013 Ron Howard epic ‘Rush’ (which if you haven’t seen it – watch the trailer here), and now Hunt’s ’76 McLaren M23D has been immortalised in Lego too. Constructed by Formula 1 building legend Luca Rusconi (aka RoscoPC) this Model Team McLaren M23D is a near perfect recreation of the 1976 Championship-winning car. With period-correct decals, a working V8 engine, and steering and suspension, Luca’s M23D is a stunning Lego replica of one of F1’s greats. There’s lots more to see at Luca’s Flickr photostream, where you can also find his extensive back-cataelgue of superb historic racing cars, plus you can read our interview with Luca as part of the Master MOCers series by clicking here. The pig-nosed driver of this Ferrari 312 isn’t taking any prisoners with that move. Under Bernie Ecclestone’s helm Formula 1 would see said combatant confined to the pits for ‘causing a collision’, but this is 1967, and rules were for sissies. The car the Ferrari has swiped has appeared here at TLCB before, a Brabham BT24, and it’s now pictured alongside the latest build by Flickr’s Pixel Junkie in this wonderfully nostalgic Formula 1 scene. It’s Brabham that went on to win the 1967 Formula 1 World Championship, despite having a slower car than the Lotus of the time, whilst Ferrari finished a lowly fifth. Ferrari may have lost the battle in ’67, but it is they who won the war, with Brabham fading into history whilst the prancing horse has gone on to win almost twice as many titles as any other team. Being British we prefer the outcome in ’67 though, so we’ll leave this post with a picture of the Brabham BT24 rightfully back in front of the Ferrari 312, and you can us find at Pixel Junkie’s photostream feeling patriotic. One of the most common comments we receive here at The Lego Car Blog, along with ‘Can I have instructions?’ and ‘Send nudes’, is ‘why don’t you feature more digital creations?’. Well in answer, we’re a blog about Lego models, and a digital creation is not a Lego model. It’s a picture of one. However, every so often a digital creation comes along that is worth flexing our rules for… this is one such time. This wonderful Speed Champions style 1970 Ferrari 512S Longtail was discovered on Flickr and it comes from TLCB newcomer Alan Guerzoni. Alan has faithfully replicated Ferrari’s glorious Le Mans racer beautifully in digital bricks, and he’s gone a step further by designing and adding period-correct decals to the render – something he’d have been unable to do if the model was build from real pieces. We’d still rather Alan’s Ferrari 512S was constructed using actual LEGO though, and fortunately it can be – awesome decals included – thanks to the LEGO Ideas platform, where the Ferrari is currently available to support in Alan’s quest to see it become an official LEGO set. With LEGO already partnered with Ferrari and the 512S Longtail slotting neatly in the Speed Champions line-up we think it stands a very good chance of making the cut. There are more images to see at Alan’s Flickr photostream via the link above, and you like what you see you can cast your vote on LEGO Ideas by clicking here. As detailed in yesterday’s post, Ferrari are back on top after a few years in middle of the F1 pack, but there was a time when they barely won anything. And not because they had a bad car either. Ferrari (and everyone else’s) woe was due to the utter dominance of one car, the pioneering Lotus 79, the first car to make full use of ground effect aerodynamics. The first Formula 1 car designed using computer design aids, Lotus took downforce to an entirely new level, with the 79 producing 30% more of it than even their own car from the previous year. The suction generated by the 79 at speed was so strong that early cars suffered chassis fatigue and had to be strengthened to allow them to cope with race distances. The strengthening worked, and the cars went even faster in testing. Upon the 79’s debut at the 1978 Belgium Grand Prix Mario Andretti took pole by over a second, and won the race ahead of the next Lotus in second place by ten seconds, with Ferrari in third almost half a minute behind. In fact, so fast were the new Lotuses that Ferrari could only win if the 79s retired. Lotus finished the season with 50% more points than the next nearest team, securing the 79’s position amongst Formula 1’s most dominant ever designs. This spectacular homage to one of Formula 1’s greats is the work of previous bloggee and TLCB Master MOCer Luca Rusconi aka RoscoPC. 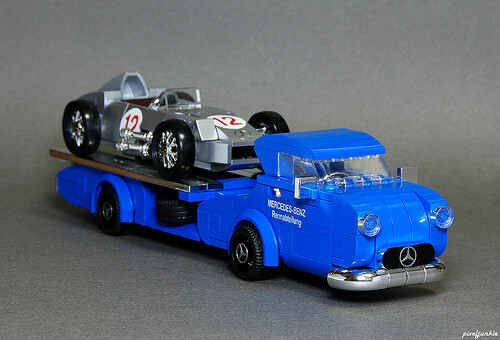 Built eleven years ago, Luca has recently uploaded his model to Flickr, and despite its age Luca’s 79 is still one of the finest Lego F1 replicas you’ll see. Accurate decals, a working V8 engine, steering and suspension are all included, and there’s lots more to see at Luca’s Lotus 79 Flickr album by clicking here. On every flight there’s always one. That lady or gentleman who – when booze is marginally cheaper courtesy of airport tax free shopping – decides to optimise this saving. “I’ll just get a few bottles to take home” they say. Sure they will. Those bottles will be empty before they’ve even boarded. Anyway, this post is for them – and to that one guy who tries to smoke in the airplane toilet – as these models are literally encouraging drinking/smoking and flying. With most countries doing what Formula 1 wouldn’t (because F1 is all about the monies), and banning alcohol and cigarette sponsorship in sport, alcoholic beverage and cigarette companies are no longer seen on the side of Formula 1 cars. This is Formula Zero Gravity, an invention by British Lego Group Brickish, and they’re single-handedly bringing morally-dubious sponsorship back to top level racing! Two of motorsport’s greatest liveries have made the return so far (with more to come), with Nick Barrett’s stupendous Martini Racing F0 racer above, and Jeremy Williams’ gorgeous John Player Special F0 racer below. There’s more to see of Nick’s build at both his MOCpage and photostream, and you can view Jeremy’s courtesy of Flickr here. Enjoy your flight!